Mi recently launched Mi 3 smart band associates with Amazon India. Mi Band Smart Wristband for Android, iPhone and Other Smartphones. Xiaomi Mi Band 3 Price in India has been set at Rs. 1,999 for the lone variant And its available on Amazon.in and MI.com only.first Sale starts at 12pm , September 28 2018 on Amazon.in and Mi.com..If you are looking for a new smart band that will track your activity, shop for the Mi Band 3 online at Amazon India. 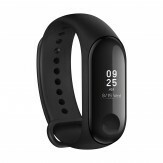 With functions like heart rate monitoring, alarm clock, Bluetooth dialing, distance recording, sleep tracking and more, you will be able to buy the new Mi Band 3 at the best price online at Amazon.in.You can follow the below steps to buy this product at their deal price.Keep Visiting dealsheaven.in for more Best offers ,hot online deals, promo code, coupons and discount . The Mi Band 3 smart bracelet by Xiaomi gives you an array of features that will leave you impressed. This new variant of the Mi Band comes with an OLED touchscreen with a big screen display so that your notifications can be viewed without any hassles. With sleep monitoring capabilities, you will easily be able to track everything you do with the Mi Band 3. Shop online for the Mi Band 3 and avail great deals and offers on Amazon.in. With a waterproof and sweat proof design, you will be able to wear the Mi Band 3 while swimming, showering or just a walk in the rain. This wearable device is made for tough environments, while looking super elegant when you wear it. With the help of the Mifit app, you will also be able to switch on sports modes and track your distance, heart rate, speed and other data. Shop for the Mi Band 3 smart bracelet online at Amazon.in and enjoy great deals. You will be able to see all notifications on the meticulously designed OLED display panel. You will be able to track your activities in real time and never have to worry about running out of battery as a single charge can give you a an ultra-long standby time. You will also be able track your heart rate continuously as the Mi Band 3 automatically starts recording your data when you wear it on. With a raise to wake feature, all you have to do is raise your hand to brighten the screen to see your notifications. Purchase the Mi Band 3 at Amazon India and witness features like pedometer, sedentary reminders, 3 page message display and much more at an irresistible price. Enjoy a seamless shopping experience when you buy the Mi Band 3 smart bracelet online at Amazon.in. How to Buy Mi Band 3 Smart Wristband for Android, iPhone and Other Smartphones?